Front Cover text options. 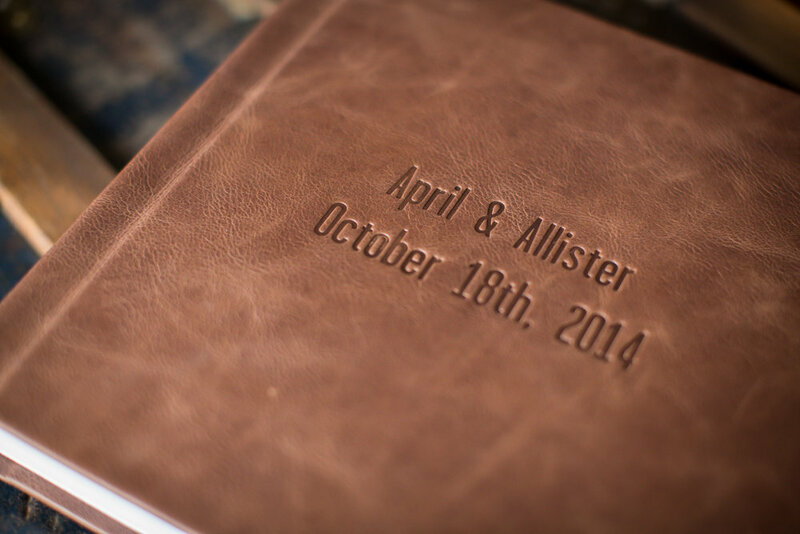 Included in your album is the option to stamp the front color with the text of your choice. You can write up to 2 lines, with 22 characters per line. Many choose to write their names, wedding date, or both. If you wish to leave the cover blank you can do that as well. To see a behind the scenes video of the printing facility these are made in, click here! Have you ever seen your parents or grandparent's wedding photos? 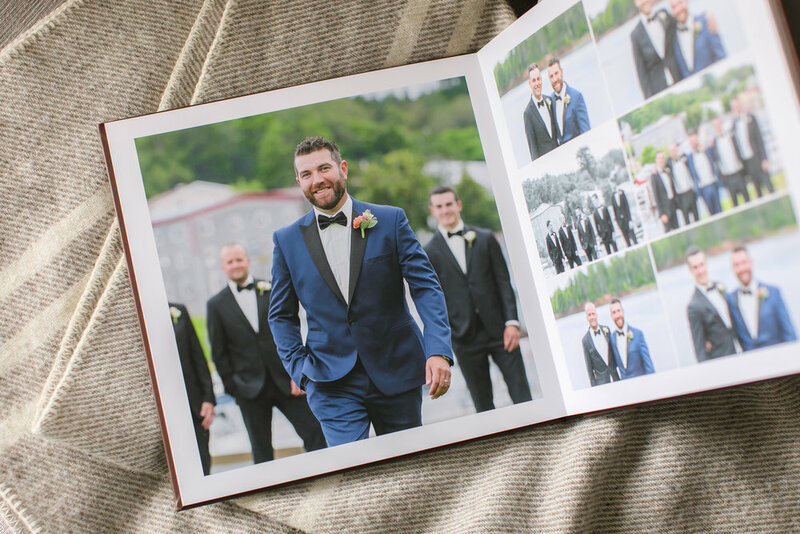 Chances are they were printed or displayed in a wedding album and the ability to share and enjoy these memories is priceless. 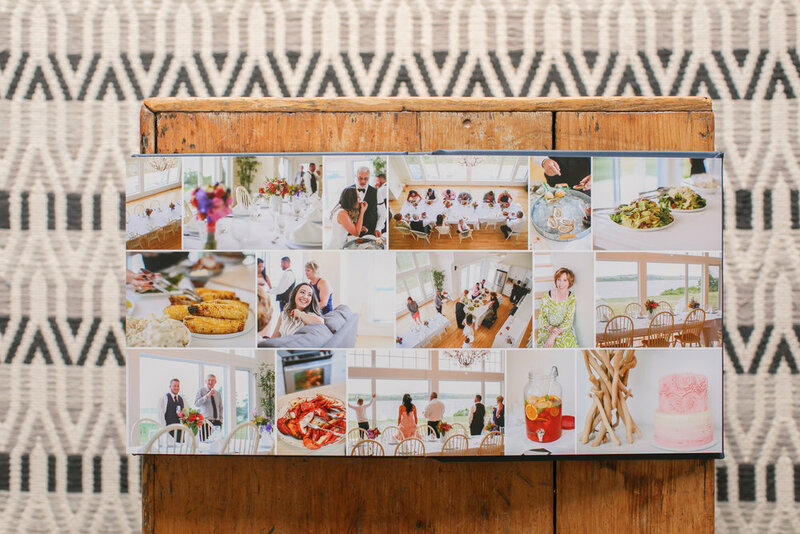 The idea of handing down a file folder of wedding images to your children just doesn't have the same appeal and longevity, and may not even be possible decades from now. 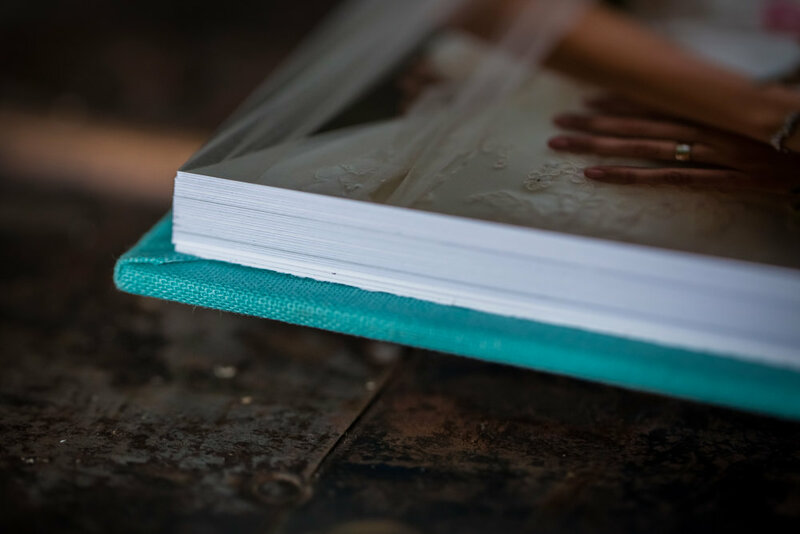 You've made an important investment in wedding photography and of all the things you spend money on for your wedding, your photographs are the ONLY thing that will go up in value over time. Especially, if you can flip through a gorgeous album instead of sitting at your computer clicking 'next' with your mouse. I take pride in the albums that I offer. 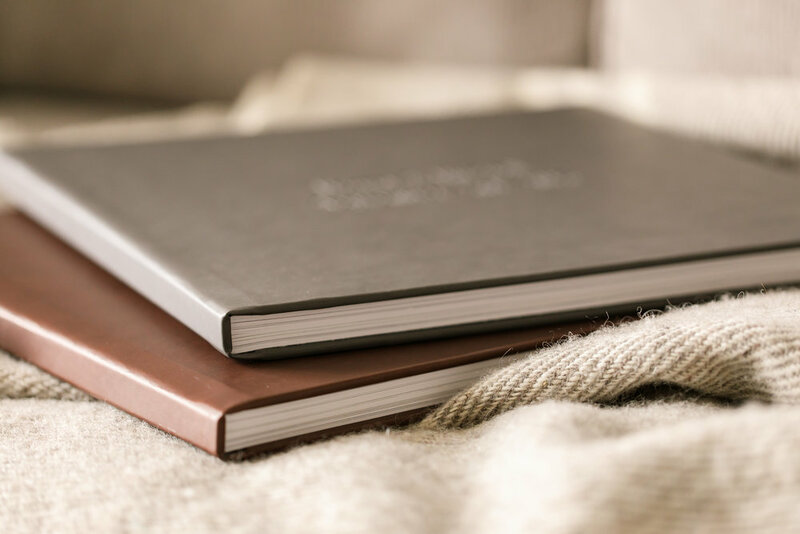 Every one is handcrafted in the United States using high quality materials like thick photographic paper, and genuine Italian leather. I was amazed when the first album I ordered included paperwork showing 7 different people had signed off on it before shipping. The craftsmanship and attention to detail is what really set these albums apart from the crowd. When purchasing something you know is going to be passed down in your family for generations, you need it to be a solid, quality product that will survive many years. These albums are HEAVY. 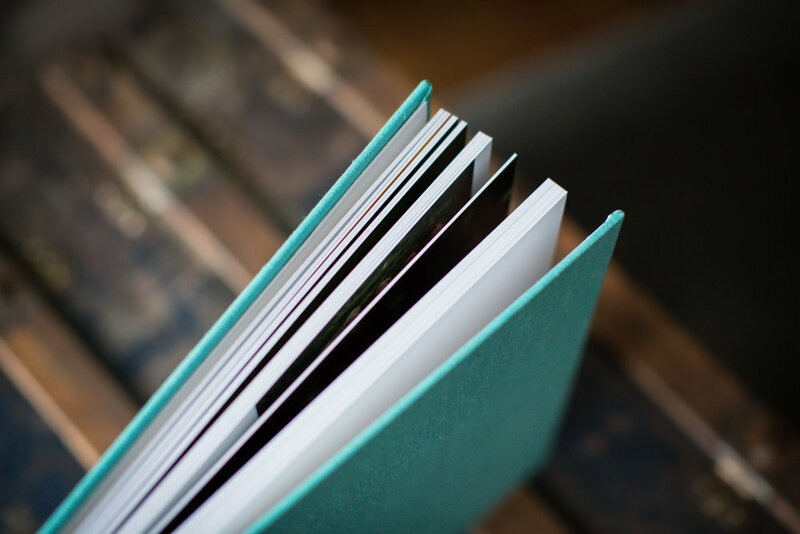 Every album includes lay flat pages, expertly cut paper, and pro inks. 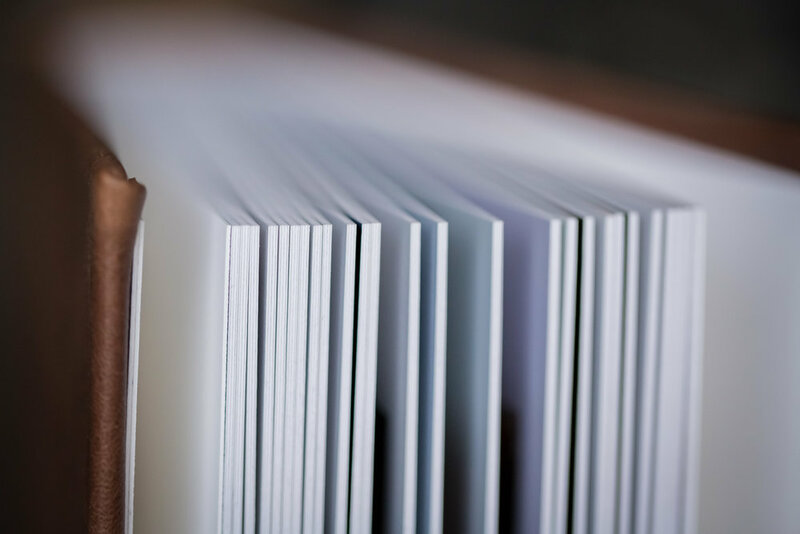 They come in 10 x10, or 12 x 12 sizes, with either 40, or 50 pages. Each album includes your choice of 28 cover options. Yes, 28! Colorful linen, standard leather, and distressed leather. Included in your album price is also the option to stamp the front color with the text of your choice. You can write up to 2 lines, with 22 characters per line. Many choose to write their names, wedding date, or both. 2 font choices are also available. On the inside, your album is filled with only the photos you choose to include. After a quick and simple selection process by clicking 'favorite' on your online gallery, I take the time to custom design every page. 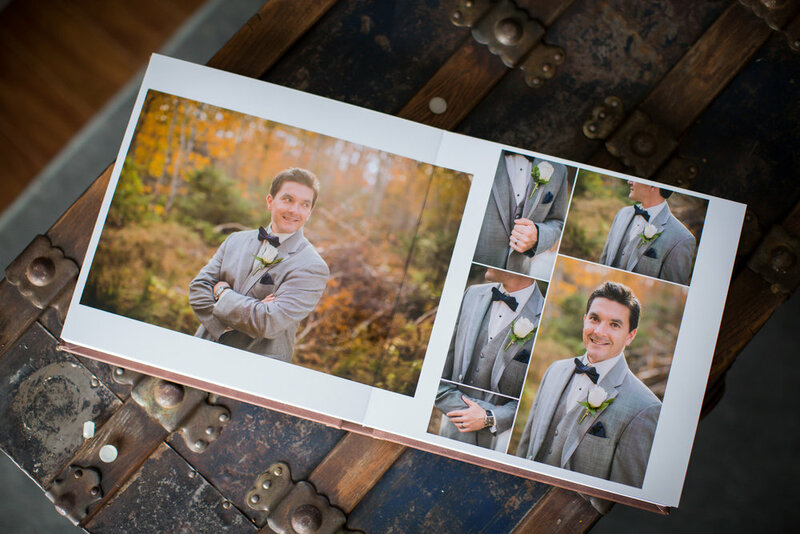 Photos are mounted directly onto the album spread and the Fuji Pearl paper makes every color pop. As the client, you give the final design approval after requesting any edits you wish. 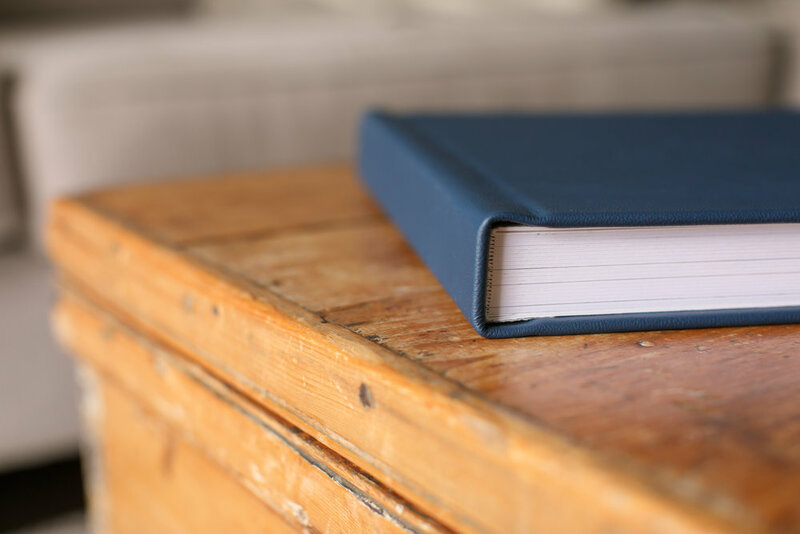 One of my favorite features is the 1/16" thick pages. 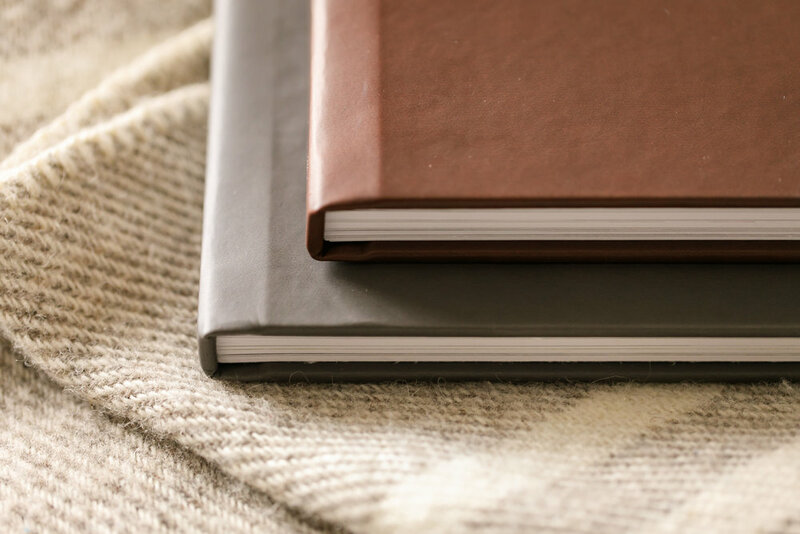 You're not going to worry about a page being bent, ripped, or crushed over the years. I will be the first to admit, wedding albums from any professional photographer are not cheap. But it is for good reason. 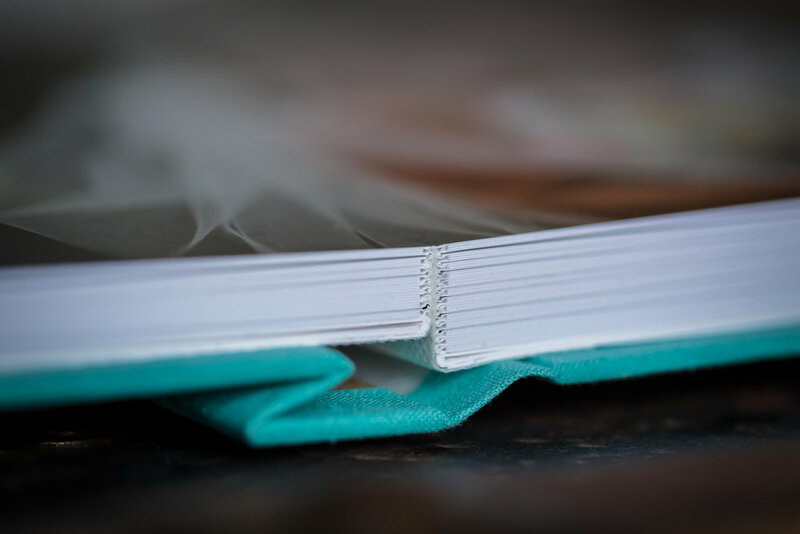 They are hand stitched, custom designed, and not mass produced like online photo books. At the end of the day, your wedding photos are the only thing that remain, and they deserve to be showcased with pride. To learn more, contact me here.